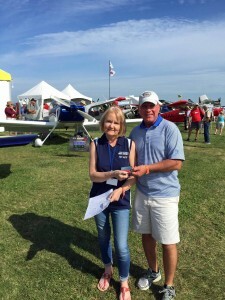 A picture of me purchasing a Van’s RV-8 Kit! Welcome to my RV-8 project website. My name is Tom Gray from West TN and I have had the passion for aviation dating back to my childhood. As a kid I collected as many toy airplanes as I could get my hands on and as a teenager I spent countless hours with a friend at the local airport admiring the planes. I watched intensely as the pilots performed their preflight checklist before taxing to the runway thinking someday that would be me. Well my dream became a reality on October 12, 2000 in Olive Branch, MS. From the time that I stepped into the left seat of a Cessna 172R, it felt right! I continued flying until 2002 at which time I got married and became a proud father. Needless to say, flying took a back seat and now fourteen years later I am reigniting that flame again! Not only am I resuming flying activities, but I will be starting the building process of a Van’s RV-8 soon. I have several friends who have built and are building RV’s and when I saw them it was definitely love at first sight! I recently completed my 22′ x 50′ shop and received the Vans RV-8 kit so this project should begin in December, 2015 or sooner. At that time I will be posting pictures and updates of the construction process from beginning to end. In the meantime I invite you to view my RV-8 Gallery which contains a few pictures of ones that I like.